Alternating current motors are everywhere. They power your clothes washer and dryer. You can find them in your dishwasher, garbage disposal and HVAC system. There are induction start-induction run motors, capacitor start-induction run motors, and capacitor start-capacitor run motors. Each of these AC motors is different, but they're all the same in one major way: They all consist of one or more "Run" windings and one or more "Start" windings. If your device is not working properly, you may want to perform some basic electric motor testing to diagnose the problem. 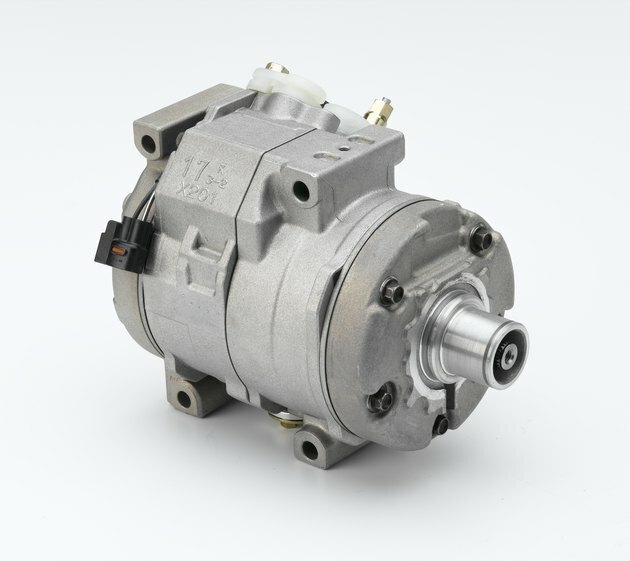 Mechanically, an AC motor has only two major moving parts, a rotor and a centrifugally operated start switch that disconnects the start winding from the circuit once the motor reaches two-thirds its rated operating speed. Turn off the circuit breaker to the branch circuit that the motor is connected to. Remove the cover on the end of the motor covering the electrical connections, and pull one of the line wires out far enough to snap the jaws of the clamp-on ammeter around it. Turn on the circuit breaker. Compare the reading on the clamp-on ammeter with the full-load amperes (FLA) stamped on the motor's nomenclature plate. What you are looking for is a significantly higher current draw. A high current draw, anything above 110 percent of the motor's rated FLA, is a sure indication of a problem. A high current draw accompanied by very noisy operation is a good indication of motor bearing problems or a bent rotor shaft. Turn the circuit breaker off again. Check the motor start capacitor start. If the motor hums loudly but fails to start under load and the ammeter indicates a current draw of six to 10 times the motor's FLA rating, the problem could be a bad start capacitor, a start switch stuck in the open position or an open start winding. Discharge the capacitor by shorting its terminals together with an insulated screwdriver. Short the terminals together by placing the tip of the screwdriver against one terminal and pressing the metal shaft against the other terminal while holding the screwdriver by its plastic insulated handle. Remove one of the wires from the capacitor to test the resistance of the start induction run motor. Set your DMM to the Ohms Function and touch the probes to the terminals on the capacitor. If the meter readout indicates "0" resistance, the capacitor is shorted out and needs to be replaced. If the capacitor is good, the readout will read a very high or infinite resistance. Check the motor's run capacitor, if there's one present, in the same manner. Disconnect the ends of the start and run windings at the motor's terminal plate by pulling the push-on connectors from the male connectors. The diagram on the terminal cover plate will indicate which leads go to the start windings and which go to the run windings. Set your DMM to the Ohms Function and take a resistance reading across each winding. A "0" reading on either winding indicates a shorted-out winding and that the motor needs to be replaced. An "infinite" resistance reading across any winding indicates an open winding and that the motor needs to be replaced. The actual resistance of the start and run windings will vary depending on the make and model of the motor, but a good rule of thumb is that the resistance of the start winding will be roughly three times the resistance of the run winding, if the windings are good. Start windings have smaller gauge wire and more tuns than run windings so they have a higher resistance. Place the probes of your DMM on the start switch terminals. An infinite resistance reading indicates a start switch stuck in the open position and that it will need to be cleaned or replaced.